Changes encounter zone levels by location (hold) and type (animal den, bandits, vampires). For a gradual, yet disparate play-through. You can use this as a base or template for any other mods. If you create a variant of Sectors (level changes/different sectors/all of the above) and post, please provide proper credit to me, explain the sectors and or how you view the progression, and have a cool map to show the sectors. Please also PM me the link to your view of Sectors so I can see and add you to the description. Inspired by a multitude of "unleveled" and "releveled" and "I don't know what the heck leveled" mods that I tried at one point, but just didn't quite make the cut. This is the predecessor of TruSectors - Legendary Capped Skyrim. If you like this idea, but would rather the enemies stop leveling after a certain point, this is the mod for you. The idea for this mod spawned from my own ideal play style. I love difficult games where you progress and have a challenge at every level, and can die at any moment. I've tried other unleveld encounter zones and settings for a while, but one thing that always bothered me was that, regardless of it being unleveled, it was still "leveled" across the board; a cave in one hold was the same level as a cave in any other, or there just wasn't enough variety. Also, after a certain level (usually well before the non-legendary skills level cap), you were well above the level steps for the mod. This mod is for those who like to work to level up, to manage quests in a new sector. This mod encourages exploring the current hold that you have the level for, and finally doing all of those little mini side-quests as you wait for your character to level up. TL;DR: Each Hold is broken down into a sector. Each sector has a minimum level (not a maximum), and most locations will have levels between the minimum level of the current sector and the minimum level of the next-highest sector. Inside each sector, different locations will have differing levels. Animal lairs will generally have base levels closer to the sector minimum. Mages will have mid-ranged levels. Forsworn will have upper-tiered levels (just below the next sector's minimum). Vampire lairs will usually be on par with 1-2 sectors increase in difficulty. Note on Dwemer locations -- these are static, but are set at a higher tier. They are metal machines with no sense of pain and it would take a lot to disable one. Mass production means they would likely all be the same quality/level. The only differences: key, special locations would have higher-quality machines to guard them. ALSO: This mod edits the random spawn game settings so something that spawns in as "easy" will be at the player's level, not 1/3rd your level. Very hard is capped at 1.75x your level. Combat boundaries for zones are also disabled--running out the door probably won't save you, so stock up on stamina potions to run away after. NOTE: This mod does not play nice with mods that slow experience gain, or prevent leveling thru the 'legendary skill' system. They are 100% compatible (all mods other than other encounter zone mods should be), but the slower leveling will seriously slow down your expansion into other sectors. Levels are scaled to allow a maxed player (without using legendary) to still be able to finish the game, thought with greater difficulty. Warnings: Most glaringly obvious--Winterhold is now an endgame location, and all levels reflect that. If you want to start playing as a mage and do the College quests right away, this mod is probably not for you. Whiterun has a minimum level of 25. Dragur locations have a minimum of +1 sector difficulty (Rift = 37). If you want to do the main quest right away at bleakfalls barrow, this mod is probably not for you. Limitations: This mod does not add any higher-level enemies, you will likely not receive the full benefit of this mod just using the vanilla Skyrim enemies/powers/gear/setup. This mod does not affect combat. There are plenty of great mods that do so already, so I will leave that to them. I did this thru SSEEdit using the game to look up locations and UESP for information on which hold it was in, enemy types, etc. otherwise I would still be at this for much, much longer. 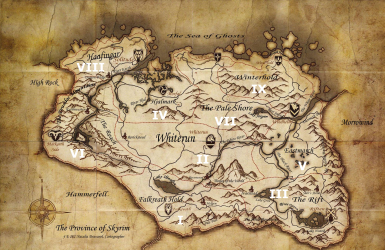 I cannot guarantee I have all the locations in Skyrim Legendary Edition, but I did my best to get them all. Sectors were chosen also based (in small part) on general playthrough, and difficulty with regards to Frostfall (not required), where snowy areas are generally more diffficult. Mimimum levels are minimum levels for the hold, not for you to access. You can likely enter a hold and complete things above your level with a follower. Or five. Falkreath was chosen as Sector I for two reasons. Whiterun and its hold is the most over-used area (even by me) and I wanted to break it up as the starting point, and Helgan is part of Falkreath hold. This mod assumes that you will level up your character in a per-area basis prior to moving on to a new sector in the game. YOU WILL NOT be able to complete the main quest before leveling sufficiently, even the beginning quest for Bleak Falls. * In cases where more than 1 enemy type is present, higher difficulty generally takes precedence. Should be fully compatible with any mod that does not alter encounter zones. If you load both, the one lower in the load list will overwrite the other. Run Wrybash to merge .esps! - or - have your mod manager remove the file. Note on uninstall: It is likely any area loaded by the game will still have the higher-level enemies. You may need to wait in a place outside the cell you want to respawn until it respawns for the levels to normalize. Uninstalling should be safe--all this file does is say: Hey bro. See that hold over there with the low levels? Let's add a few for veriety! Advanced Organized High Level SkyTweak Encounters Patch - AAE, HLE, OBIS, AT, SkyTEST. A patch project made to add all mod-added perks/spells/etc. to all other mod-added enemies.